Would love feedback on how it plays. I feel like it probably needs another gameplay element in order to stand out. What about time manipulation? Or items that slowdown sliding? This is really cool, if the snails had animation it would add a whole other level of awesome! I had considered it! That and an invulnerability thing perhaps. I'm not sure if powerups will be enough, or if there should be a more significant gameplay change. Animations are coming! Literally the next thing on my to-do list! I had considered it! That and an invulnerability thing perhaps. Would you say a Blinx or Braid system would be complicated to achieve in playmaker? It would be doable, but yeah, I'd imagine it'd be complicated. I haven't really looked into it. Did you use unity for the snails animations. Nah, I used Blender for all of the animations. - Coin Powerup, when you fill up the coin meter, you become invulnerable for a period of time. 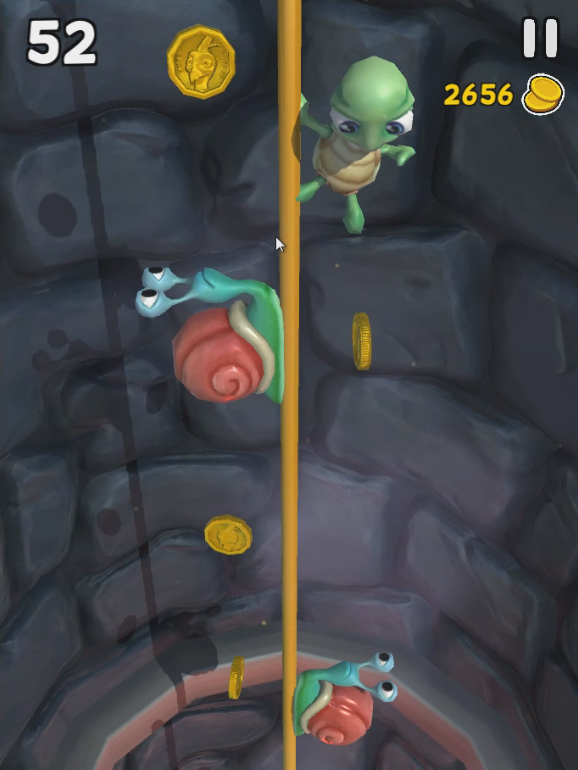 Colliding with snails when you're a Super Turtle will defeat the snail and award more points as you defeat more snails. I totally love your style! When I got to about 70 point I started getting motion sickness though lol. Maybe if the camera started looking down the hole at a sharper angle the faster you go? That way you could also plan your moves a little earlier. Anyways just a though, keep up the good work! Thanks for the feedback, Graham! I'll have a look at how I can tweak it somehow without having to change too much. Looks really nice. love the effects and the slow mo.